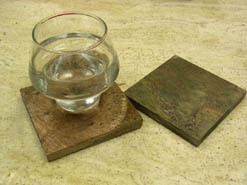 One of the great things about the stone drink coasters listed below, is that they all have the natural ability to absorb the moisture from a sweaty glass, right into the pores in the surface of the material. 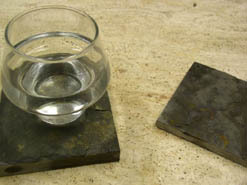 The water is then held within the surface of the stone until it can evaporate out into the air. Golden yellow sunflower hues, a field of floral sunny tones, alighting on the surface of these slick and smooth polished glass chips, creating a surface of unmatched perfection upon which you can place a glass or sweaty beverage without a care, knowing that the innovative canal design will funnel all damaging moisture away from the slippery chips and down into the natural sandstone base where it will be absorbed into the stone. 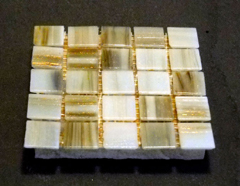 Honey tones, gold and light, streaking in powerful beams and bursts across the surface of these exquisite glass coasters. And yet between each chips smiling face is a tiny canal, a gap in the square through which moisture from a sweaty glass and trickle and drip, slipping unnoticed into the surface of the porous sandstone, where it will be cradled until the natural process of air and evaporation causes it to disappear upon the wind. 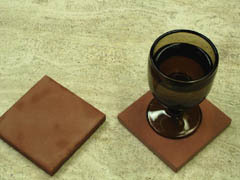 Points of light and dark, white and black, gold and brown and other hues, each alighting differently, unique upon the surface of these coasters. And yet the impermeable glass does part, each chip making way for a tiny canal, leading any errant moisture down into the highly absorbent belly of the sandstone base which waits below. Brilliant colors of gold and copper mesh and match, mix and churn, stretching in individual squares across the surface of these attractive glass drink coasters. 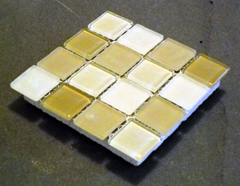 And yet unlike other glass pieces, these are actually highly absorbent glass coasters, with the clever canal design transporting any errant moisture down into the belly of the sandstone base which waits below. 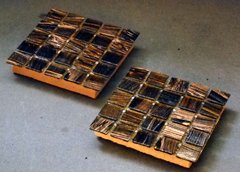 Flash, crash, the bursts of light explode through the stormy countenance of these coasters, providing points of ecstatic illumination which illuminates the otherwise midnight demeanor of these glistening, polished coasters. As the light from a room slips into the translucent face of these pieces, the coasters will almost take on a living glow, radiating the warmth of the light back into the surrounding room. Marble is one of the most elegant natural materials available. Generally available in a wide variety of colors ranging from pure white to midnight black, its the multicolors which are arguably the most interesting. Here we see an image of deep green marble, powerful and bold, with a sea of green tones broken erratically by white lightning whisps. However, all of this is just a print, set into a naturally absorbent sandstone material below. A bold and dramatic vision of ancient stone work, whose beauty and artsistry is enhanced by the fact that the image has been imprinted on a similar piece of stone itself. 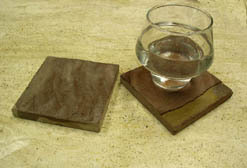 This gives the picture an almost 3d quality, which makes it stick out from the smooth honed surface of the coaster, dramatically casting the weight of its dignity and age across the environment in which these naturally absorbent coasters are set. The boldest colors of natures brush contrast and contend with one another in an exotic dance across the surface of these sandstone drink coasters. With wild abandon they explode in wavering lines, creating a facade of intricately precise patterns, which emerge unique, in each individual coaster. 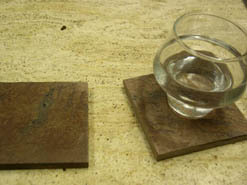 Equipped with rubber bumpers on the bottom, these absorbent and decorative coasters will not scratch your furniture. Swirling bands of light and color wash across the surface of these natural sandstone drink coasters, creating an intricate work of natural art, that is different and one of a kind in each and every individual coaster. Dark clouds of tempestuous storm arc brilliantly across a sandstone backdrop, creating a powerful contrast in these all natural sandstone beverage coasters. Made from highly absorbent natural sandstone that is quarried right here in the United States. Subdued colors float in a hazy shadow of grays and browns, creating a dreamlike appearance in the surface of these attractive and stylish beverage coasters. Highly absorbent, made in america, and backed with cork to protect your table top surfaces. A million intricate points arranged by mother nature, to create the subdued, but startling surface of these absorbent drink coasters. 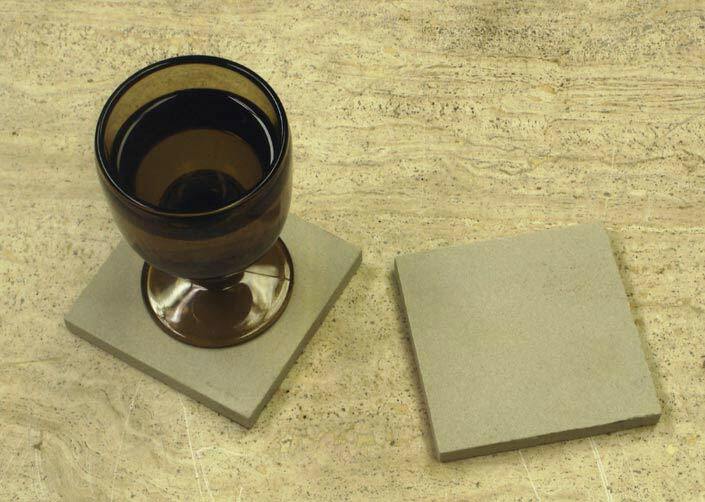 Sophisticated and unique, these sandstone beverage coasters provide the powerful impact of a towering mountain range, and the absorbent functionality you need in a set of coasters. A tiny little tree frog, bug eyed and ready to hop, sits perched upon a verdant leaf. Beneath this portrait, a sandstone coaster waits, to absorb the moisture from a wet glass. A beautiful and stylish way to personalize your home. How many cats can you count in this coaster? They are staring out at you, with eyes demanding respect, demanding a glass be set on their heads, so that they can, in their own sandstone way, absorb the moisture and hold it in, waiting for the air to evaporate it away. Sandstone has the feeling and texture of a sandy beach, and can be used naturally in any beach themed decorative space. However, when you start printing beach images on the sandstone, well then you've got a set of coasters that was made for the waves. 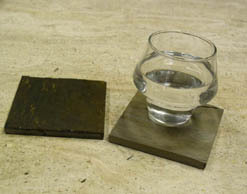 Copper slate has some of the absorbing ability that sandstone does, however it is not quite as eager to receive the liquid. That means, it is also more resistant to stains than sandstone pieces would be. 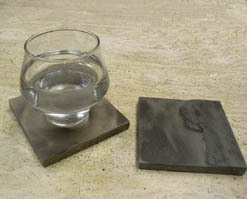 Earth slate drink coasters are the perfect accessories for any earth tone based decorating situation. Taking their colors from the mountains where they were quarried, these coasters contain a wealth of vibrantly contrasting tones and hues. One of the great things about gold blush coasters is that they will absorb the moisture from a glass, but not too quickly, which means that fruit juice and other colored liquids wont stain them as much as more absorbent counterparts. 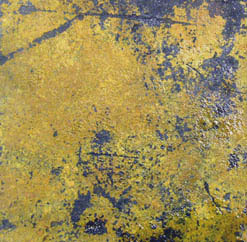 Even if they do get a stain, the multicolored surface of the stone hides it so you will never know. Mountain black coasters are a cloudy sky at night, they are the waves of a thousand midnight oceans lapping over one another, they are darkness, and mystery, waiting to protect your furnishings from water and stains. 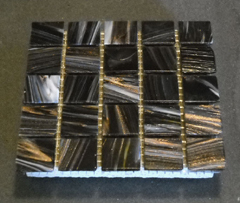 The surface of each and every multi african slate drink coaster that we offer is made unique by the colors, hues, and tones, which arise naturally during the formation of the stone. Powerful, stately, and in many ways startling, these natural decorative and functional pieces are sure to make a statement in any setting in which they are placed. 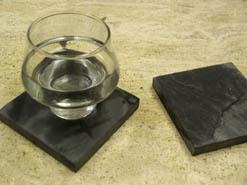 It is hard to describe the Multi China slate beverage coasters. That is because each and every one is a unique piece of natural art, with its own personality, and style, which is unlike any other coaster, or any other stone in the world. Red earth coasters feature a sea of red tones, all swirling and massing over one another, to form a subdued portrait of fire captured in the natural stone face of the coaster. Looking at the printed surface of these lovely drink coasters, engages your mind in an ancient world, one full of mystery and danger, where there were still lands to be discovered and conquered, still glorious new civilizations to meet, and where the whim of a king contrasted with the sword of a pirate. Engage yourself in this epic ancient landscape, with these attractive and functional kitchen accessories. The faded image of this stately palm, stand out in contrasting hues against a mysterious backdrop. Off in the shadows you can just make out the image of a door, as ghostly hints titillate your mind, you are drawn ever deeper into the mystery, caught up in the excitement of the ancient alluring world beyond. 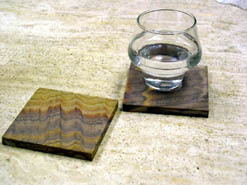 All of this occurs, right in the surface of these stately stone coasters. Simple images, yet somehow powerful, like the paintings plastered by our ancient ancestors on the walls of the caves which they made their homes. These pictures are primal, they sit almost naturally in our collective unconscious, symbols of the most basic elements of life and humanity. When matched with a surface of pure natural sandstone, the effect is dramatic and powerful. The simple image of a potted plant, almost timeless in its purity, sits in faded relief as the central emblem of these attractive coasters. Framing them are two layers of ringing decorative bands, the first a basic pattern, done in a classical greek color arrangement. The second ring is the sandstone itself, the natural beauty of the material enhancing and displaying the central focus of the coaster. Printed Natural Sandstone - 4"
The fleur de lis is an old European symbol, that was found in many crests and standards used by the nobility during the middle ages. A favorite of French Knights and the Royal French Family, it is also an important symbol to the swiss and the English, who have prominently displayed it in a number of flags and standards. Today it is a symbol of purity, nobility, courage, and gentility. It evokes a feeling of stern justice, and kind power, that has not really been felt since the time of the dashing knights of yore. 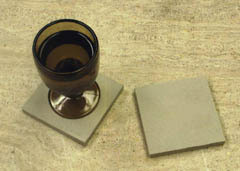 The natural surface of these absorbent sandstone coasters has been covered with a human depiction of what a natural stones center should look like. Within this image you can see sharply contrasting tones, mixed with images of light and dark, quartz gemstone crystals, clustering around harder bands of stone and rust. The result is a union of human and natural beauty, into a duet which is powerful at the same time that it is meaningful. Ancient runes and mysterious relics. What lies beneath the surface of the carved stone? Well in fact the carving is a simulation, created by light and shadow. In actuality the surface of these coasters is perfectly smooth and flat, composed of just gently textured sandstone, which not only grips a glass, but absorbs the moisture from it right into its belly. An explosion of contrasting colors, followed by another, and another, each one burst, vomiting forth flames in a wild display of personal beauty, only to fade to black, and be replaced in a moment by a thousand more lights. All of this and more has been designed into the image which was printed, and merged with these naturally absorbent stone drink coasters.